The goals of behavior management are to establish communication, alleviate fear and anxiety and deliver quality dental care. 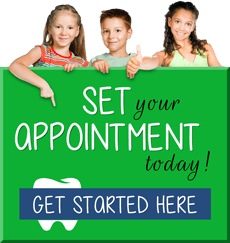 We hope to build a trusting relationship between our dental team and your child. We want children to have a positive attitude towards coming to the dentist and their oral health. What sets Toothworks apart from most pediatric dental offices is that we accomplish these goals without the use of medication/sedation. Parents are always welcome in the operatory with their children. We use distraction, positive reinforcement and verbal communication to accomplish the necessary dental care for your child. We use a tell-show-do technique that involves verbal explanation in language that the child can understand in a non threatening setting. Recover the tooth as soon as possible, making sure to hold it by the crown (top) and not by the root end. Rinse, but do not clean or handle the tooth more than necessary. Reinsert the tooth in the socket and hold in place having your child bite gently on a clean piece of gauze or tissue. If the tooth cannot be reinserted, carry it in a cup containing milk or water. If you act quickly it's possible to save the tooth. Time essential so come into our office as soon as possible. There are times when it is necessary to remove — or extract —a tooth. Infection, orthodontic correction or wisdom tooth problems can also require removal of a tooth. Sometimes a baby tooth doesn't fall out as it should, and the tooth must be removed to make way for a permanent tooth to erupt. We always try to save teeth, but occasionally a tooth may have so much decay, or an associated abscess, that it must be removed. Sometimes, a space maintainer is necessary to hold space for the permanent tooth to erupt when a primary (baby) tooth is lost too early. Dr. Harvey recommends that if you must tell your child about their extraction, use the words wiggle the tooth, instead of pull, rip or yank. At Toothworks Pediatric Dentistry, we know that going to the dentist may be scary for children, so we strive to make every child feel at ease! Dr. Harvey will work with you to decide the best plan for your child. In case of emergency, please call us as soon as possible at 313.343.8790. If the emergency occurs after hours, there is always an emergency contact phone number on our answering machine. Most children need a little extra comfort during their first few pediatric dental visits to familiarize themselves to this new experience. Special care dentistry provides customized health care to children affected by physical, psychological or mental disabilities. Usually, these individuals need added assistance while undergoing and learning about their dental treatment. Children with special needs may have a higher incidence for various oral issues, such as gum disease, cavities or other problems, so it is important to find a qualified pediatric dentist for your child. Your child has unique capabilities and Dr. Harvey takes the time to individually learn who your child is and how best to approach your family’s unique situation. Some children are sensitive to touch, new people, and even a change of environment or routine. Dr. Harvey and her team at Toothworks Pediatric Dentistry realize this and will do their best to ensure your child is always seen by the same team member — and treated in the same room and chair. Our team will also assist in teaching your family about efficient dental habits you can help your child with at home. Dr. Harvey has been trained in behavior guidance, sedation and a variety of other techniques to make sure your child is comfortable throughout their visit, based on their health needs. To learn more about Grosse Pointe pediatric dentist Dawn Yuen Harvey D.D.S., M.S., any of our special needs pediatric dental services or to request an appointment, please contact us here or call our office directly at 313.343.8790.